Wash and carefully dry the apricots before quartering and stoning them. Weigh the fruit and then weigh out the same weight of granulated sugar. Mix the fruit thoroughly in the sugar then layer the apricots and the sugar in a bowl, making sure there's a good layer of sugar on top. Cover and leave for 24 hours (the fruit does not need to be chilled). The sugar will extract some of the fruit's juice. The next day, shortly before you are ready to begin cooking the jam, sterilise some jam jars by washing them in hot, soapy water, rinsing clean and placing in an oven set at its lowest temperature to dry. Scrape the apricots and all their sugary juices into a preserving pan and stir in the lemon juice. Clip a jam thermometer to the edge of the pan. 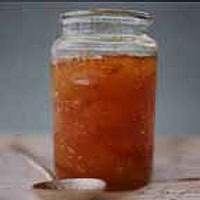 Set over a low heat and stir regularly until the sugar has completely dissolved into a clear syrup. It's important not to allow the mixture to boil until the sugar is completely dissolved. (If the mixture gets too hot turn off the heat and continue to stir until it has cooled slightly.) At this stage, turn the heat to high and bring the mix up to a full boil. Cook briskly, stirring regularly to stop the jam sticking and burning, until you have just exceeded jam setting point at 105°C on the jam thermometer. Remove from the heat and double-test for setting point by dropping some of the jam liquid on to a cold saucer. Allow it to cool slightly then gently push with your finger. If it wrinkles, then it has reached setting point. If you don't have a thermometer, boil the jam hard for 8-10 minutes after the sugar has dissolved, then remove from the heat and test for setting. In either case, if the jam has not reached setting point, boil for another 2-3 minutes and test again. Skim off the excess froth from the jam and allow to sit for 15 minutes. This will prevent the fruit floating to the top of the jars when filled. Decant the jam into your sterilised jars, cover with a disc of waxed paper (wax side down) and then cover tightly with a dampened cellophane disc, secured with a rubber band. Leave to cool then store in a cool, dry place for up to a year. Refrigerate once opened.